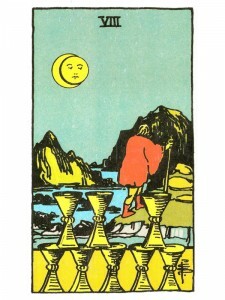 Eight of Cups shares that you have emotionally over-extended yourself. Go deep within and regenerate your energy – search for a deeper meaning in life. Allow your Higher Self to search and find your “inner” need as you seek spiritual fulfillment. Your passionate nature and lust for life has lead to overindulgence to the point of burn-out. You are tired, feeling drained, depleted and emotionally ripped off as a result of filling other peoples needs and wants to the exclusion of your own. Dissatisfied and disappointed, you want something entirely different – but you don’t know what. Look for other alternatives, find the courage now to retreat and heal yourself. Take time out for yourself and search for meaning – a purpose that is worthy of your total commitment and dedication. Allow yourself to feel the “blahs”. Rest and you will regenerate as new ideas begin to germinate. Your basic fortitude and hope for the future are strengths that other people depend on – some people are too needy, making you feel manipulated and used without a return of energy. Avoid this psychic drain and take time out to care for your own needs. The time has come to move on – put the ordinary things of life behind you and move forward. Withdraw from outer activity and seek a greater self-awareness. Prepare to leave this stable situation and journey into the unknown. Your ego is being broken down in order to free your spirit. Rest now, restore your energy in quiet solitude. Mature emotions, secured with the lessons of love without improper attachment and capable of seeing beyond immediate surroundings. Your heart is opening wider, getting larger as you love expands beyond the immediate circle of mate, family and close friends into a more universal love. This is the heart’s parallel growth to the ego, which has begun to integrate with universal mind at this level. Emotional drive here, comes not from dissatisfaction with what you already have, but because your emotional world is growing, your emotional pie is actually getting bigger. Magically, everyone already in your life will still get the same size piece of pie, even as your time is prorated for others. Creative productivity and expansion. A blending of the masculine and feminine energy. Emotional efficiency creates an abundance of reliable inter-activity. Two’s – lessons learned in accommodating both, that set the stage for the highest emotional lesson – love of self and love of others must balance as they move toward becoming one and the same. What do you feel weary of or dissatisfied with? What relationships or values are no longer relevant in your life? What or who is drawing on your energy and leaving you feeling emotionally drained? How can you withdraw or take time to renew yourself? Next to Magician: You can reach the top now – think carefully before making any choices. Do what you KNOW is right and do not listen to outside opinions. Next to Hermit: Be patient and inner joy will be your reward. Be willing now to forge ahead. Next to Chariot: Channel all your energies toward reaching your goals and do not get involved with unnecessary situations. In the first position: This is the magical path of the faithful heart, which will successfully balance the purity and power of personal romantic love and its extension into family with an equal complementary love for mankind and all creation. Power to heal through love and intensity of involvement. Emotional focus/mastery create abundance of love and energy. In the second position: You can find a needle in a haystack – find energy when and where you need it. You can extract joy from the least likely of circumstances, pleasure from sources of pain and, you can move mountains. In the third position: Your emotional house is in order, your creative energy in good supply and you can explore the corners of your heart for new possibilities. Your emotional pie is going to grow, unless you subvert it. In the fourth position: Anyone who marries this archetype has the lessons of jealousy, patience, envy, independence and then some. Here is a person who is compelled by the grace of God to help foster universal love. This is the calling of John the Baptist, of Christ and the mission of the Apostles. Even though the Apostles were commissioned to teach, theirs was nevertheless the path toward universality. In the fifth position: There is confidence here – good taste is at work. You are reviewing a situation ripe with possibilities, pushing your mind out as an advanced scout. You have added some new plays to your playbook – now to wait for the game. In the sixth position: Time for major expansion in your emotional/creative plane in the near future. The pull you are feeling is symbolized by the positive effect of the moon. The lure of the unknown as part of the grand design to stir us to seek more experience of the one. To know – the participation of our emotional/sexual and creative natures in bringing us knowledge of God. In the seventh position: You will be presented the challenge to enrich your emotional/creative house with new energy. In the eighth position: Emotional/creative enterprise is underway – possibility is in the air. You are influential now and should have things your way. In the ninth position: One of the most difficult principles to understand and follow is the lesson of non-attachment. Even the teachings of Jesus on these matters has been distorted in the New Testament, suggesting that his followers were told to turn their backs on their families. What is meant here is that we must not limit ourselves to our families, to our extensions of ourselves, anymore than we can limit ourselves to a love of self. In order to honor the self, our path requires that we extend outward as much as we can, requiring what has been called non-attachment. This heart appears poised to seek and to offer more love. In the tenth position: The breadth and depth of your life will expand by this time next year in such a way as to amaze you. Even though you have set the appropriate wheels in motion – it may take your breath away like the heart’s gasp on first seeing the magnificence of the Grand Canyon. Wow, this is really helpful and diana the way you interact with people makes it even more informative. I just started using tarot, intending to use them just for meditations and spiritual connection for now. After cleansing and shuffling them I have been asking each day what they want me to know about them and pulling a single card to meditate on for the day. I have pulled (in order) High priestess, the Hermit, and 8 of cups. Day 1 I was worried they were telling me I needed to wait and not approach the cards yet, but I didn’t stop and this blog has been immensely helpful. I think they are actually talking about a drinking problem I have been tackling but losing faith with a little. That I need to decide and make that change to be able to open myself to this new connection… so thank you. Ela, you do not need to understand the cards to read them – as you read them you will experience various emotions – Example: That doesn’t apply to me – then just ignore it, it wasn’t meant for you today. Wow, that hit the nail on the head – listen to it, it was meant for you today. Out of an entire card, you may only have one sentence that actually is meant for you at that moment and time. When you do that with each card, you will end up with exactly what you were meant to hear. I really am so happy I came across your site. Completely changed my Tarot practice!